There are two types of battery analyzers: the fixed current units and the programmable devices. While fixed current units are less expensive and generally simpler to operate, programmable analyzers are more accurate and faster. Programmable units can better adapt to different battery needs and are more effective in restoring weak batteries. One of the main advantages of the programmable battery analyzer is the ability to test the batteries against preset parameters. Fixed current analyzers perform well in organizations that use medium size batteries ranging from 600mAh to 1500mAh. If smaller or larger batteries are serviced, the charge and discharge currents are compromised and the program time is prolonged. Here is the reason why. A fixed current battery analyzer with a current of 600mA, for example, services a 600mAh battery in about three hours, roughly one hour for each cycle starting with charge, followed by discharge and a final charge. Servicing an 1800mAh battery would take three times as long. On the low end of the scale, a problem may arise if a 400mAh battery is serviced. This battery may not be capable of accepting a charge rate higher than 1C and the battery could be damaged. When purchasing a battery analyzer, there is a tendency to buy according to price. With the need to service a larger volume of batteries of a wider variety, second-generation buyers find the advanced features on upscale models worth the extra cost. These features manifest themselves in reduced operator time, increased, throughput, simpler operation and the use of less trained staff. Adaptation to new battery systems is also made easier. Figure 12-1 illustrates an advanced battery analyzer. The Cadex 7400 services NiCd, NiMH, SLA and Li-ion/polymer batteries and is programmable to a wide range of voltage and current settings. Custom battery adapters simplify the interface with different battery types. A quick test program measures battery state-of-health in three minutes, independent of charge. Nickel-based batteries are automatically restored if the capacity falls below the user-defined target capacity. An advanced battery analyzer evaluates the condition of a battery and implements the appropriate service to restore the battery’s performance. On nickel-based systems, a recondition cycle is applied automatically if a user-selected capacity level cannot be reached. Battery chemistry, voltage and current ratings are user-programmable. These parameters are stored in interchangeable battery adapters and configure the analyzer to the correct function when the adapter is installed. 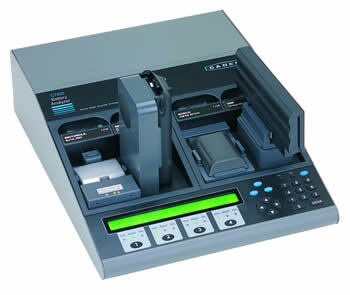 In the Cadex 7000 Series battery analyzers, for example, each adapter is preprogrammed with up to ten distinct configuration codes (C-codes) to enable service for all batteries with the same footprint.